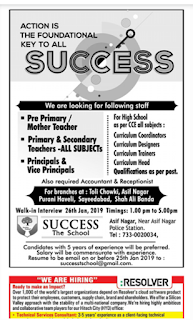 Success The School,has advertised for the recruitment of Teaching Faculty- Pre Primary Teachers,Principals,Vice Principals jobs vacancies. Interested and eligible job aspirants are requested to walk-in 26th January 2019.Check out further more details below. 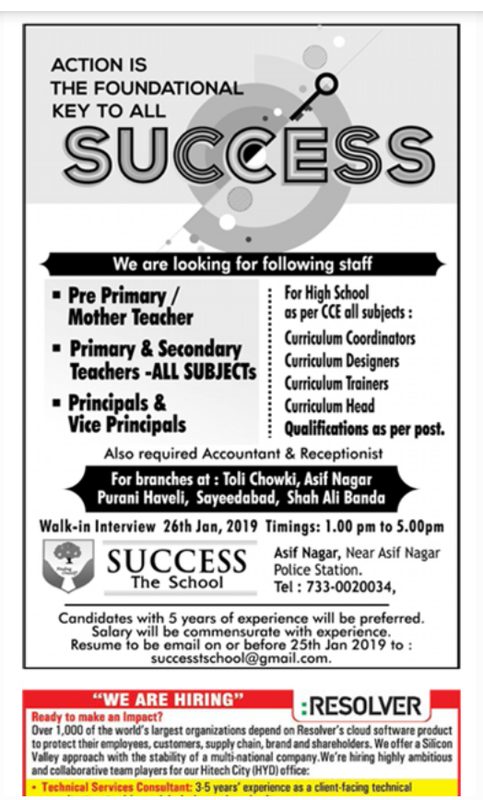 About School:Our Success The School is on a lookout for the following personnel for Toli Chowki, Asif Nagar, Purani Haveli & Shah Ali Banda branches.Success The School is on a lookout for the following personnel for Toli Chowki, Asif Nagar, Purani Haveli & Shah Ali Banda branches.. Candidates with 5 years of experience will be preferred. Salary Package:Salary will commensurate with experience. How to Apply: Resume to be email on or before 25th jan 2019.